When David finally has a chance to climb the mountain behind his new home he has no idea he is about to meet a fabulous mythical creature. Even if he had known, who could have guessed that a Phoenix would turn out to be so stuffy, so pompous-and so utterly endearing? (To say nothing of its fondness for Aunt Amy's sugar cookies!) 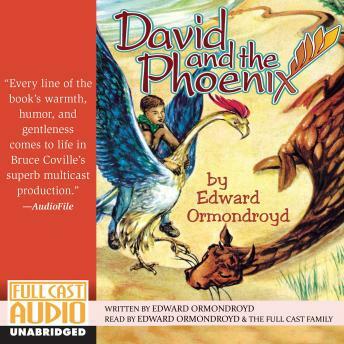 When the Phoenix decides to take a hand in David's education the adventures-and the hilarity-really begin. Alas, the wonderful visits to gryffons, sea monsters, and banshees will come to a crashing halt if the scientist stalking the Phoenix is successful... A tale filled with high humor and deep humanity, this much beloved classic springs to new life in a full cast recording that features the author himself as narrator.